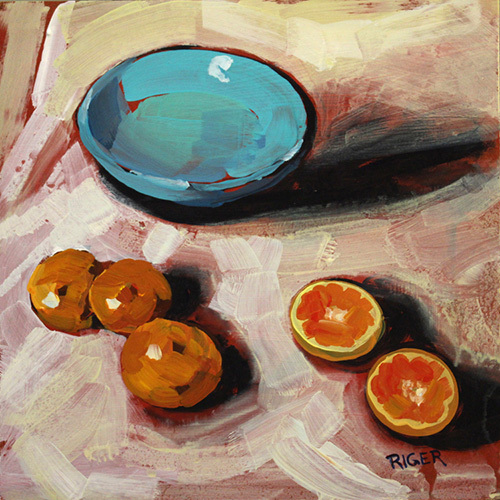 Bold, expressive brushstrokes are the hallmark of artist Sue Riger’s energetic and vibrant, light-filled paintings. Visit her website to enjoy more of her work. I’ve taken hundreds of pre-dawn nature hikes because I love to see the first light of day, especially on a misty morning. The mystical peace of those moments is indelible for me as an artist. In our hurry-up world, we long to slow down and savor beauty. That’s why I aim to create still-points—art that arrests our attention long enough to soothe us back to mindfulness and calm. After sixty trips around the sun, I am more amazed each year at the splendor that surrounds us. My gratitude needs to spill out somewhere and a loaded paintbrush is my favorite tool of expression. Much as I love to paint, shortly after receiving my BFA degree in painting, I put down the brushes to homeschool my kids. Eighteen years later, I was excited to have time and energy to paint again. But I found my skills had gotten rusty, and I no longer wanted to painstakingly layer glazes of oil paint as I had done years ago. To get back into the swing I decided to take the plunge into acrylic painting. I took a few workshops with artists I admire. I was thirsty for learning again and the interaction was invigorating. Among other things, I learned that studio work demands strong lighting on the subject. I was like a kid happily playing with paint and discovering new skills. Although I still begin my work with underpainting, I look for ways to keep my art fresh. That’s why I like painting a variety of subjects and occasionally buying a fun new accent color of paint. A bouquet of fresh flowers really inspires me. Recently, I began painting flowers and water in glass containers. What fun that is! The water bends light and color into the most interesting and surprising shapes. In still life, negative space is as interesting to me as the subject itself. Sometimes I add playful lines, sometimes I’m armed with a spray bottle to create happy accidents in the paint. If I could offer any advice to new painters it would be to study under someone who inspires you. And don’t be afraid to use a lot of paint. That’s been the hardest thing for me because paint is so expensive; it’s a challenge to be lavish with the wonderful stuff. But the beauty of a visible brushstroke makes it all worthwhile. To me, a loaded brush can leave behind a mark that’s even more lovely than blended strokes that perfectly represent the subject. Also, brush strokes can direct the eye and aid in composition (thank you, Vincent). But it’s easy to lose the freshness of brushstrokes. “Place the stroke and leave it alone,” I keep telling myself. Most importantly, I always look for light. Light is visually exciting and—like a misty sunrise—it can also evoke serenity and peace. And that’s what I’m after. Artist Sue Riger invites you to follow her on Instagram and Facebook.